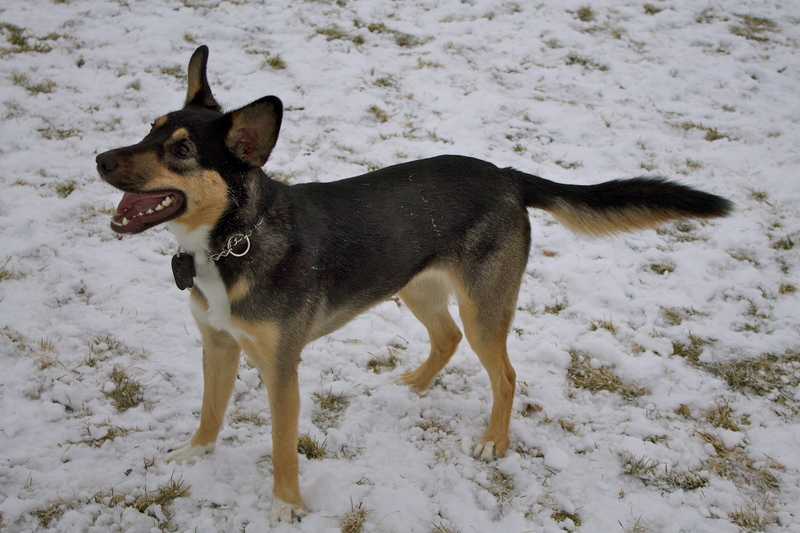 30 Responses to Bringing Toys to the Dog Park – A Good or Bad Idea? 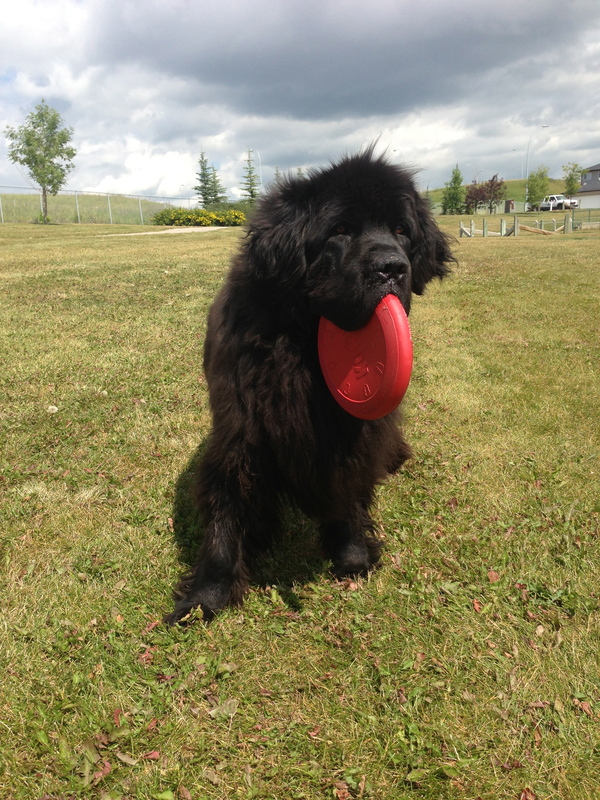 If the dark park is empty, I will take Torrey’s frisbee so can get exercise.Other wise no. I tried that recently and another dog got it and played keep away from everyone, even the owner. Haha – yeah our frisbee stays home most of the time for that very reason! We don’t go to the dog park very often and neither of my dogs like fetch (weird for Labs!). But is used to bring toys for our Sally when we took her to the dog park. Of course that was 15 years ago and they were a bit saner and not free-for-alls like they are now. It all comes down to the humans – if they are paying attention, toys can be fine…if the aren’t (too frequently the case) toys can be a recipe for disaster. Good points. We go to the park infrequently, and I pick our times and locations strategically based on the quality of other owners who seem to attend. Mr. N likes to chase after dogs that have balls. He doesn’t want the ball, he just likes chase. We’ve had a few incidents where the other dogs get snarky and snap at him or shove him so I try to keep him away from ball playing dogs now… We were at the off-leash park once and there was a woman with a new dog who didn’t want her dog interacting with other dogs. At the off-leash park. That drives me crazy! 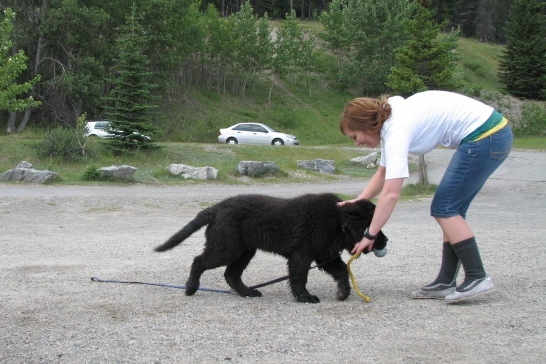 There are plenty of on-leash parks – granted, many people let their dogs off there too – and if your dog can’t handle the chaos of a dog park, you as the owner should make the decision not to go. Dog parks are free for alls, everyone knows that. If your dog doesn’t like strange dogs approaching him, don’t bring him there. Ugh. Wow! A dog park is not the place to be if you don’t want to interact with dogs! People amaze me. We would take our flying squirrel (a soft Frisbee) to the park on occasion but stopped when dogs kept stealing and trying to destroy it. I wouldn’t mind letting other dogs play with the toy but I did have an issue with them running off with it and trying to tear it to shreds. If by some stroke of rare luck Moses was able to get another dog’s toy that’s exactly what it would look like he’s doing – heading off to gnaw on the toy! I might know that Moses is famously kind to his toys (still has his very first toy ever and it’s in good shape), but others don’t know that, so I could understand their disapproval. But you know the solution: no toy brought = no toy lost or destroyed. 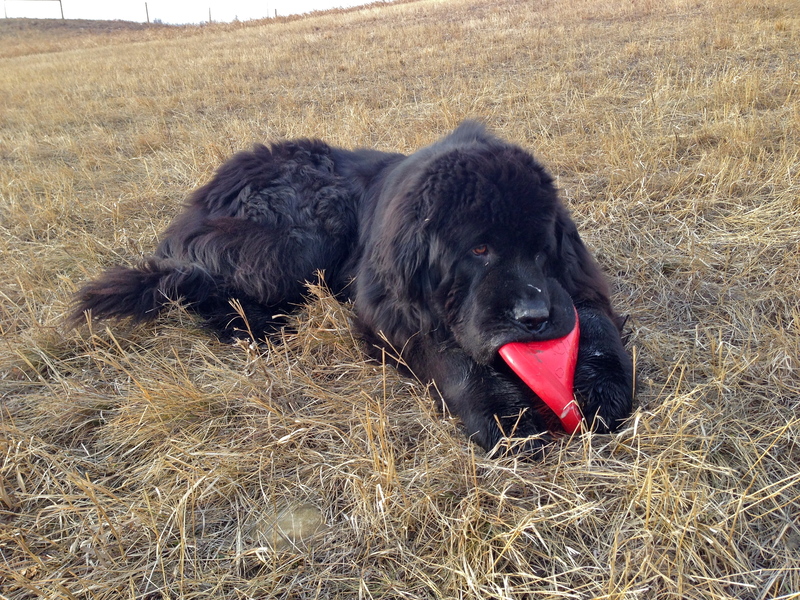 Our nice Kong frisbee mostly stays home for this reason, too. 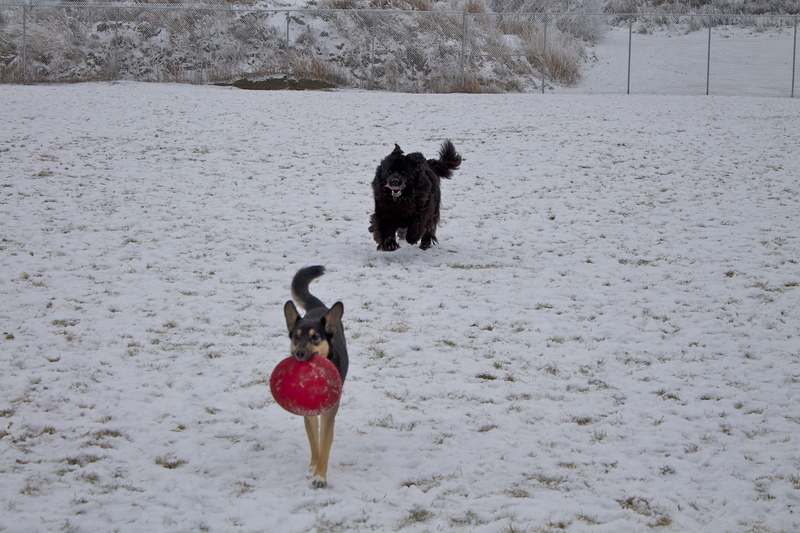 Never been to a dog park with no toy rule… but we haven’t been to one in years anyhow. I used to bring a squeaker cuz ball for Luna to parks, she was taught to drop the toy if I told her to so we could avoid conflicts with the possessive dogs. Eventually we got the toy back. 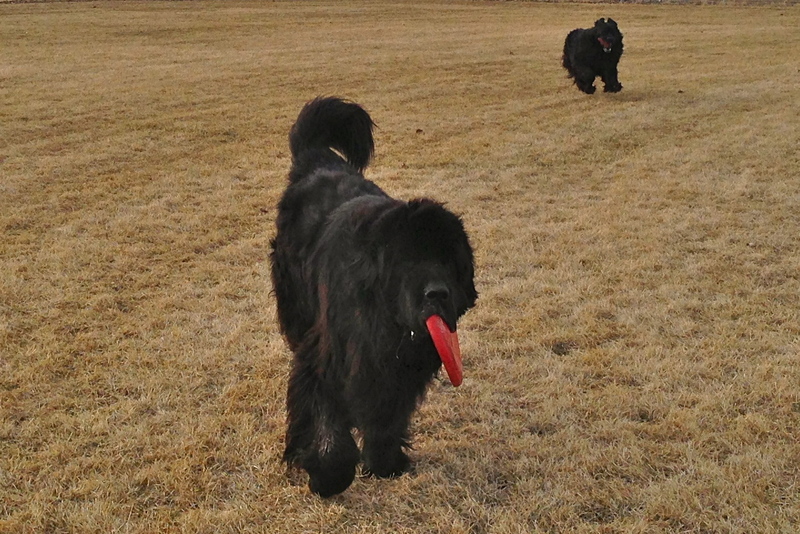 Everyone enjoyed when luna would get the toy because she is a master at enticing a game of chase with the dogs. With the right group it was all fun and dandy, but we did run into quite a few possessive dramatics. Overall we stay away from dog parks, my girl is really picky and doesn’t do well with dogs without manners… and clueless owners attached. Some really great looking parks out west, east coast seems to be lacking. Oh and Luna often has the mentality of Moses.. too far or too often means I get to go fetch. Wyatt will always pick up her slack and will fetch till you decide to stop. I haven’t seen any parks with a no toy rule, but that might not be a bad idea. We’re lucky in our city with lots of off leash areas – a few could easily be made no-toy with little consequence, I would think. We don’t go to “dog parks” but we do train in parks all of the time with our bumpers and sometimes ducks, (ssh don’t tell). 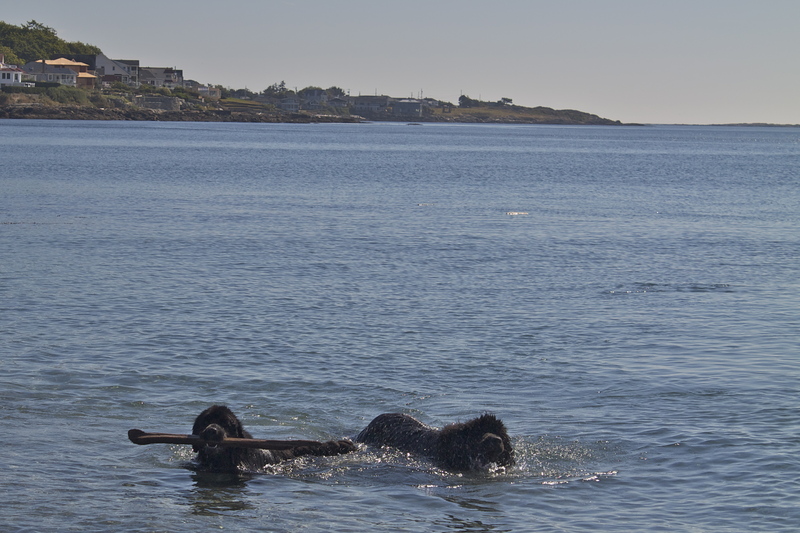 We have rarely had the issue with other dogs going after the things our dogs were retrieving. Of course we keep an eye out and if it looks like we will have an issue we wait until the other dog has moved on, or we move. Chessies can be possessive of their things, but I was really happy to see all three of mine give up their toys when we were playing in the yard the other day. I worry about the two males, but Thunder was fine giving up the toy to the more demanding Freighter. Still I would not put them in that position with dogs they don’t know and we watch them like hawks. Loved the pictures of baby Moses….oh so cute! LOL Oh we get that too. All of the time. They want to stop and chat and usually we have limited time and the dogs are going nuts waiting for their turn. That is why we joined a private training ground last year and will probably do it again this year. Peaceful training. I am of both minds on this one. We have been to both kids of parks, but prefer the one without toys. Jasper is sometimes a resource guarder with tennis balls when it comes to other dogs, but he is getting better (with training). I think my bias against the ones that allow toys is that they tend to be the ones with the most irresponsible owners. The ones who don’t watch their dogs and control them when trouble starts. The regular attendees at our dog park are more responsible and we have park sheriffs that patrol the lot. I think you make somre great points though. If I could choose a toy-free park, that would probably be my selection every time. Alma used to resource guard when we first adopted her, but she’s come a very long way. If a dog is showing an overly intense interest in a toy, she’s okay with dropping it and not causing an issue. Park sherifs are also something I’ve never seen (heard rumours of the odd bylaw officer patrolling the off leash), but would welcome whole-heartedly. Keep-away is much more fun than fetch! I will sometimes fetch once, but I make sure they know I’m doing them a huge favour. Bipeds shouldn’t throw it away if they want it! lol! Spoken like a true canine! Agree on all counts, especially with the first rule: don’t bring toys to the dog park you aren’t willing to lose. That’s just dumb. Shiva is a thief as well. Sometimes I think she finds it more fun to play with another dog’s toy than her own. 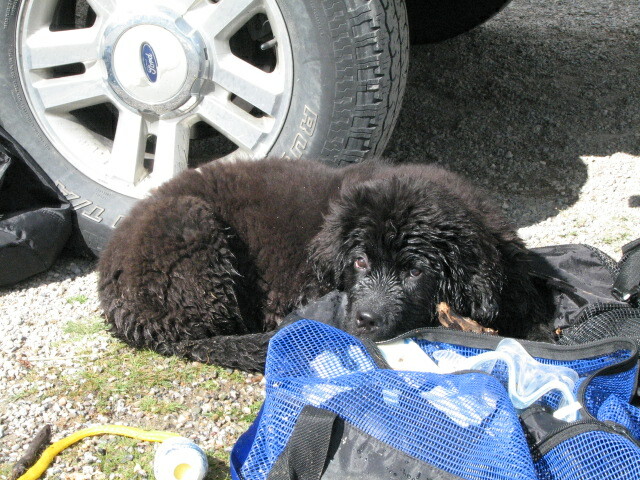 Since she doesn’t fetch very well her stolen balls and discs often get lost in trees, mud, and lakes. I refuse to feel bad about this. Okay, that’s not true. I do feel bad but I shouldn’t. This is a dog park. A dog park for dogs who do dog-like things. I am not a fan of toys at dog parks for this reason. Because Shiva likes to steal and there are some dogs out there who don’t take kindly to her swiping, she has been involved in an incident or five over the resource. Granted, this can happen even without the toy as another dog has freaked out at her over a stick she swiped, but I like to minimize the possibilities. While Shiva isn’t a resource guarder, she will never back down from a fight. Alma and Shiva definitely have that in common: refuses to back down from a fight! It’s my greatest anxiety with her, because even though I can be pretty sure she won’t start anything, I know she’ll try to finish anything started by another dog – and it’s the other dogs who are the unknown factor. A reason my trips to the park with Alma are incredibly infrequent – my stress isn’t a good element to add to the situation. I have not given a lot of thought to bringing toys to a dog park or not but that is because Chester and Gretel aren’t interested. I have seen some dogs become “ball thieves” but never seen anyone on the receiving end of the thief get up in arms about it….although they may not be particularly thrilled. One I am conflicted about is bringing dog treats to parks. Many of our off-leash dog parks prohibit food. I totally understand people food. However, I am not one to believe that your dog should be 1000% predictable and calm around other dogs to bring your dog to the dog park. Gretel is good 95% of the time but still has some anxiety issues. For the 5% of the time that she freaks out on another dog, I need a treat to get her attention again (she is VERY food motivated). I understand the thought that bringing dog treats could cause a skirmish among “stranger” dogs if they are also very food motivated but I’ve never had an issue beyond the occasional moocher (and I ALWAYS ask the owner if they dog can have a treat before I give it to them). Generally I am an obeyer of rules but I break that one often. Thank you for the blog idea! Treats at the dog park – I have a story about that and I’m getting riled up just thinking about it! Stay tuned. Toy or no toys is similar to the dog park or no dog park question. It can go badly or well and it’s important to be alert to what’s happening with your dog. 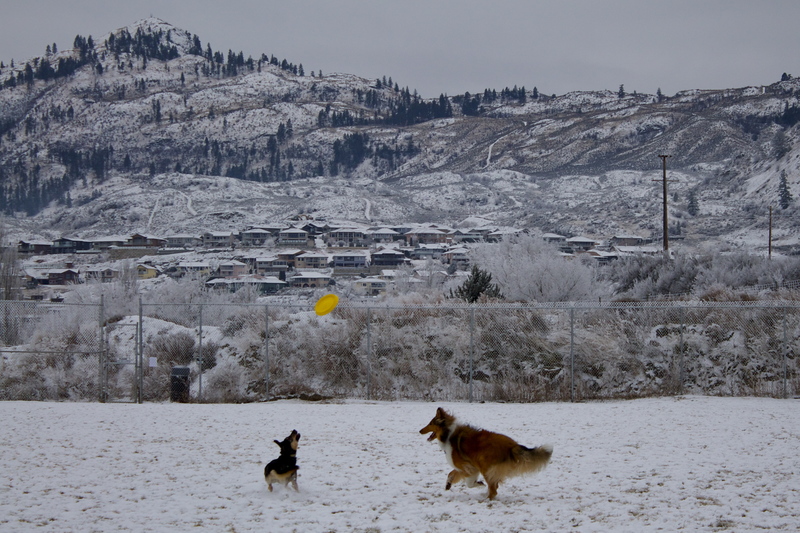 Our dog park has toys laying around–mostly tennis balls and a few frisbees. But Honey can play fetch anywhere. She can only chase other dogs at the dog park. Yeah I think Moses’ favourite part of the park is the ability to go pee on anything and everything – a luxury he doesn’t completely get on an on-leash walk. You make an excellent point – everything about the off leash park boils down to acknowledged and accepted risk. Gwynn is pretty much like your guys – “oh look… you threw that thing all the way over there… you should, like, go and get it or somethign? i’ll come with!”. Except when it comes to a game of fetch anohter dog is in the midst of playing. Then he’s interested. I don’t mind other dog owners bringing their toys to the park – it gets Gwynn running, and he’s got no problem bringing the toy back – though I do feel a bit frustrated at the people who dislike having another dog join fetch. your dog runs, my dog runs… sometimes your dog doesn’t get the ball. meh. Now that I think about it, maybe Moses keeps/carries the frisbee to prevent me from throwing it again. He must think I have some sort of awful arm spasm or something! Despite my experience at dog parks, I do believe toys should be allowed and those of us with dogs who can’t share should find other places to take our dogs. I have. My dog is toy possessive, but he’s never hurt another dog. He has been hurt, enough to warrant a vet visit. That sucked. I have a young GS that is obsessed with anything that is thrown. Unfortunately she is one that has possessive aggression tendencies. I watch her body language closely and will tell people who are throwing toys that she is obsessed. Some are smart and pick up the toy until there’s distance between us. Others, not so much. They will throw the ball right in front of her. If she gets it first she will become possessive and has started fights when other dogs try to get the ball back. Doing that is irresponsible dog ownership as well. That’s like putting 50 kids in a park with one soccer ball for them to share. There will be fights there too. Just as much as dog owners need to be aware of their dogs behavior, NO DOG OWNERS SHOULD THINK EVERY DOG IS FRIENDLY ALL THE TIME. They’re dogs, they can be unpredictable and they may fight. I believe there should some parks in every city that ban such toys. There are more breeds than not that have high prey drives. Bringing toys to the park is asking for trouble.